Here's Steve today working for DiMagic. You'll read more about them below. With the US temporarily shut down and owned by Sega of Japan, Steve eventually created the new Sega coin-op division in the US as a subsidy when they decided to start work again (all roughly within the same year). Sega, before opening up in America, looked for a strategic partner in the industry, including several toy companies. They eventually settled on Tonka, which was then owned by toy-giant Hasbro. Since Hasbro was so familiar with the industry as a whole, they were selected as the partner to help with the system. Contrary to general opinion, which is based on the view that Tonka had 'no idea what it was doing,' the company saved the SMS. As John said, and Steve agreed, Tonka allowed the Master System to stay afloat after a period of a significant decline in sales. It was Nintendo's third-party policy that dealt the strongest blow, not Tonka. In fact, if you continue to read, you'll find out another way Nintendo saved itself from what might have been a true juggernaut. After the partnership between Sega and Tonka began it blossomed into Sega of America. During this time, Steve was key in the release of the console in the US in a relatively short period. To give you an idea of the timetable, Sega of America was born in March of 1986, followed by the prototype version of the Master System at the CES in Chicago in June of 1986 and finally the official release of the console in Christmas of 1986. This means that Sega of America rose and the Master System was placed on the market within less than a year. Steve considers the solidifcation of the US base and the initial release of the Master System on such a short time table his greatest achievement while working for the company, for the reason that it was done so efficiently and managed to lead to a successful product in spite of pressures from Nintendo. After the SMS hit the market, Steve worked for Sega of America as head of research and development. His main positions in R & D were customer service (answering game-related questions, as you saw in the original article earlier in this interview) and technical service (mainly warranty issues and repair issues). During this time, he only worked on a single title, Monopoly. Since Sega was working with Tonka, which was owned by Hasbro, the latter company offered the license of Monopoly for video game release. Up until that time, Sega of Japan was supplying the American subsidy with titles, reprogramming them or altering parts for US audiences. However, programmers in Japan were not familiar with the board game and due to other developments (such as Zillion and Fantasy Zone II), Sega of America decided to develop the game in the states. Genesis and Master System main board screenshots from Monopoly. The former was the original design, the latter the result of concepts being stripped down due to limitations. Monopoly was the first Master System game developed in the US by a US team. Being their first creation, it was not without problems. Monopoly's main programming issue was the lack of memory. Because of this, a more detailed gameboard had to be abandoned for the simpler version you see present in the actual game, which almost blends in with the background. In addition, a number of important animations during play had to be completely eliminated. If you're curious as to what they looked like, look no further than the Genesis/Megadrive or NES versions. The former is pictured above with the SMS version next to it for comparison. But regardless of its shortcomings, Monopoly is looked at as the 'granddaddy' of video boardgames and led Steve to his first experience with Tetris. Though he worked on numerous games throughout the years, a number of which were never released, the only one that he remembers vividly was Tetris, because of the obvious draw of the game and then the various lawsuits that appeared following its appearance. If you want to see how complicated it was, just read about it here. While working on Monopoly in San Francisco, Steve saw another programmer messing with a PC project next to him. After watching for a short time, he asked if he could take home a copy of the game to give the programmer some feedback. Steve found the gameplay so addictive and simple that, with permission, he took the original PC version back to Sega of Japan. Sega, realizing the game's potential, then secured the license for both the arcade and 'consumer rights.' An arcade version of Tetris shortly was released after this (1988). You may have heard something about it, because it was intended for release on the Genesis/Mega Drive following its initial success in the arcades, as well as a US coin-op version. Neither were completed fully, though there was a 16-Bit version that was produced but most of the copies were destroyed. For this reason, it is the one of the most highly sought-after and expensive Genesis/Mega Drive games to this day, usually fetching several thousand dollars when it appears. Tetris arcade screenshot and some pictures of the Mega Drive release. The main reason behind the problems with Tetris were the licensing issues, which were incredibly complicated. The link provided above should give you an idea. The rights for home consoles were thrown around from Nintendo to Tengen and back again, leading to the legendary Nintendo vs. Tengen lawsuit. Tengen actually got a hold of the rights for the arcade version in the states, unbeknowst to Sega, and released their coin-op title the same year as Sega of Japan's version after Steve brought them the game. Tengen then attempted a console release of Tetris, but ran into problems from Nintendo, which led to the closure of their business. Sega, of course, decided it would be best to avoid causing more problems or getting involved in the legality of the case, which had already exploded into near ridiculous proportions. Though the legendary title was intended for release on home consoles, the Master System included, the idea had to be abandoned. One can only imagine the impact it would have had in the states and abroad! It wasn't however, completely erased from the company's history. If you check out the following link for a look and listen to the tune from the arcade version of Tetris, you should notice something familiar. No? Columns. Sadly, most gamers are unaware of the history of Tetris with Sega and consider Columns a poor copy, when in fact, it was the best they could do with the lost license. It wasn't a total loss either, because it's still making Sega money. After Tetris and Columns, Steve's work focused mainly on customer service involving hardware, as mentioned earlier, as well as the few articles he wrote for the Sega Team newsletters. Certain issues he didn't remember because he didn't have direct involvement with them, such as the abadonment of Woody Pop, but he did remember Captain Silver, which we can now put to rest. As assumed, it was cut down to avoid higher cost while milking a bit more out of the Master System before the Genesis hit the market. The PAL versions were kept intact because of the system's popularity overseas. Steve worked solidly with Sega until the end of 1991, when he officially left his beloved job of thirteen years. After this, he started his development company for ASCII, working on several controllers (one for the Genesis and SNES, in fact) and a few games. The only games he worked on were Double Clutch (Mega Drive PAL title), Pro Moves Soccer and Spellcraft: Aspects of Valor. Spellcraft was based on an older DOS title and was never released, but you may recognize some of its remains in The Immortal. Funny how things sometimes never die, but get passed around by programmers or shared. A number of NES/SMS games give witness to this, such as the Kid Kool/Psycho Fox similarities. Steve never left video games in spite of some setbacks now and then and in 1999 started a development company with several friends for 'virtual surround sound' technology for sound effects and music to be utilized by game programmers. The current company he works for is called DiMAGIC (you saw this earlier in his email response) and way above, in fact you saw him at the company's THX-certified studio in Japan. He took that picture just for us. 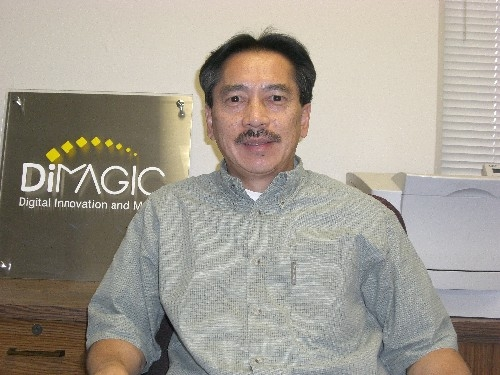 If you want to read about DiMagic to learn more details about the kind of work Steve does at the moment, check out their US site here or their Japanese site. In addition, if you have any more questions, let me know and I'll direct them to Steve to update this interview. Well, that's it then! I want to thank Steve again for his time and responses, the interview shed some light on the history of Sega as well as a bit on the Master System. I hope you enjoyed it as much as I did putting it together. Next time, we move on to a friend of Steve's, Tom Sloper! See you in a few months!